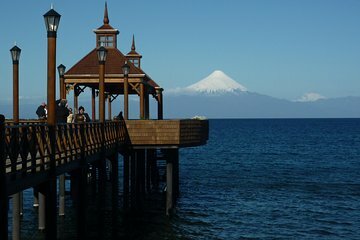 Discover the natural wonders and gastronomic heritage of lakeside Llanquihue on this 6-hour tour from Puerto Varas. Discover Llanquihue’s German colonial history, sample the city’s famous Bavarian-style sausages (extra cost) and get a glimpse of local life as you pass dairy farms, salmon farms and breweries. After visiting the memorial to the German colonists, head to nearby Frutillar, where you can tour the German Colonial Museum and visit the Teatro del Lago (Lake Theater).